IN the previous part we made it more apparent that nothing has changed for prospects of UPC in the UK because the Brexit plan has not been called off and nothing except some words on a Web page can suggest otherwise. To put it bluntly, Lucy (Baroness Neville-Rolfe) is either clueless or delusional. She is blindly saying what CIPA, Battistelli/EPO and few other interest groups urged her to say. We are still seeing the effects of poor (and EPO-bribed) bits of so-called ‘journalism’ about the UPC. It’s more like churnalism or propaganda and a lot of people are not even realising it. Here is Inovia modifying its own headline to make it even more misleading and make it seem like the UPC has just been authorised by the British government. The UK probably CANNOT ratify the UPC; some words on a Web page — words that contradict everything we know about Brexit — are nothing but an exercise in stupidity, but UPC hopefuls will latch onto anything. The United Kingdom government is preparing to ratify the Unified Patent Court Agreement, it said on 28 November. The move took the patent community by surprise but failed to relieve uncertainty about what will happen when the UK finally Brexits the EU, according to patent attorneys in the UK. Or even “never”, although that would come across as undiplomatic. “The alternative would be to say wait until we leave the EU,” Tufty the Cat wrote and he is right. IAM previously said something along these lines as well, before it drank some new Kool-Aid. “Ultimatums are no go,” Benjamin Henrion said, alluding to supposed deadlines imposed by the EPO. To Hell with CIPA. It is just a front/lobbying group of the rich law firms, and it’s so manipulative that it should come under regulatory laws (like most/all lobbyists). May, whom I personally met and chatted with for a long period of time, clearly doesn’t know what she’s doing here, so she probably parrots what CIPA and some patent lawyers told her to say. Not wise. The nuclear industry wants nuclear tensions and maybe war. It’s the same for patent lawyers regarding the UPC. May should recognise that CIPA is not a friend but more like a Trojan horse trying to shift policy in favour of a very small group that put money in its pot. Just see his latest UPC lobbying while doing Brexit work. Look at his statements amid Lucy’s and May’s bizarre move. Is he now blatantly interfering in foreign affairs? Pardon my French, but BULL-****, Sir. That statement is filled with multiple factual errors, but then again Barnier is a politician. 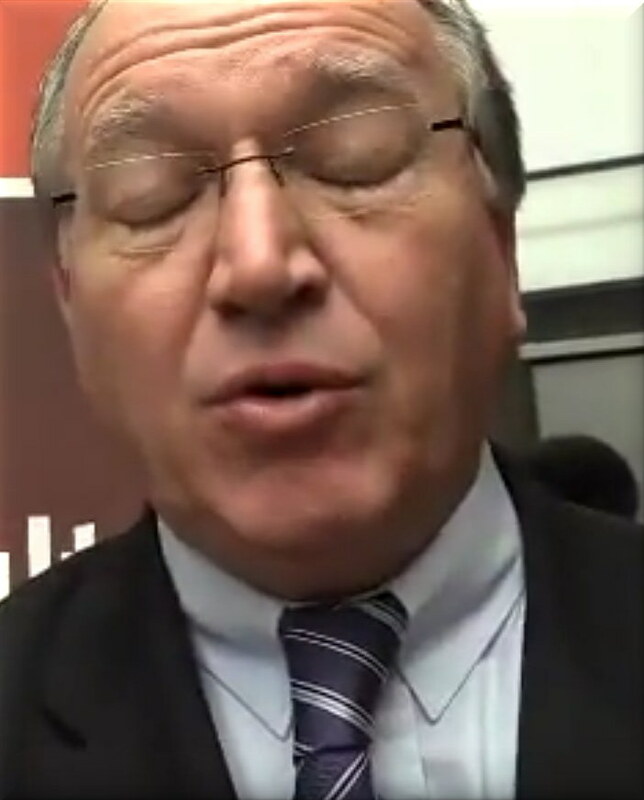 When his mouth/lips move he lies (the same goes for Battistelli, who is also a politician). “May should recognise that CIPA is not a friend but more like a Trojan horse trying to shift policy in favour of a very small group that put money in its pot.”This is an utter lie again. 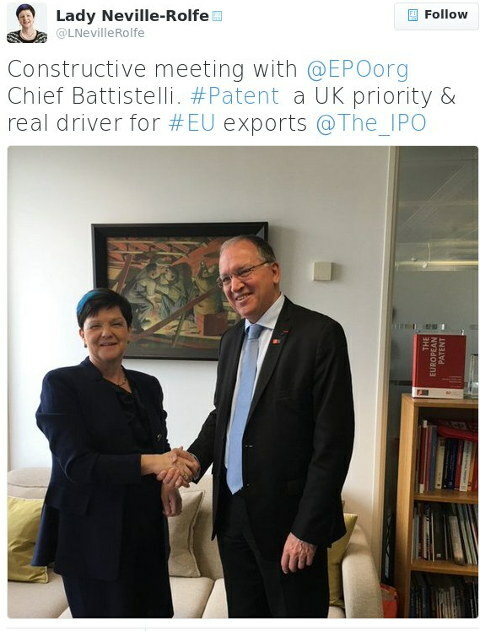 It’s consistent with what Bienkowska has been doing for years (we wrote about it when she protected Battistelli's UPC ambitions and belatedly responded to complaints about Battistelli). She is either totally clueless or a liar. We presume the former and we encourage people to explain to her what the UPC really does. SMEs actually oppose the UPC. She was probably lied to by Team UPC, pretending to speak ‘on behalf’ of SMEs (because Team UPC lacks morals, it just has a mission]. Bienkowska spoke again like a drone of Team UPC and MIP quoted her as follows: “We are not speculating about the future” – this is about getting #UPC going after 40 years – @EBienkowskaEU at press conference” (she doesn’t seem to realise what the UPC is, based on such a statement). The EPO has existed for this long, but the UPC push/ambitions have not, so this is revisionist history. –Benjamin HenrionThey want reassurance from May and Lucy before those two even check feasibility. What an embarrassment to our political system. It’s nothing but words on some Web page. It is “good for patent trolls,” Henrion wrote, but only if it actually happens at the end (not likely at all). Here come the liars from the EPO. A UPC hopeful from Germany wrote that “Margot Fröhlinger gives a first hand account how the UK’s intention to ratify came about #brexit #upc #ipsummit pic.twitter.com/ExdxpcT7NZ” (Margot Fröhlinger is Battistelli’s right-hand lobbyist for UPC these days). Patent lawyers and multinationals are behind this, not “industry and NGOs” (Henrion even asked “which NGOs?”). –Dr. Birgit ClarkMargot Fröhlinger — like the Liars in Chief (Battistelli) — should be assumed to be lying all the time. Henrion told me that he believes CIPA is what Fröhlinger called “NGO”. How comical would that be? In this case, “raised awareness” is a euphemism for aggressive lobbying and threats/moral panic by CIPA and Team UPC. Watch some of the patent microcosm commenting on this in the law firms’ Web sites [1, 2]. They’re absolutely delirious! “I don’t make predictions anymore,” said Alex Wilson of Powell Gilbert at New York’s forum, as he considered when the UPC and Unitary Patent might come into effect. While the UK’s announcement represented an ascent on the long-running “UPC rollercoaster” there were more dips to come, including the actual ratifications in the UK and Germany, the question of what happens post-Brexit and the appointment of judges. In Palo Alto, Bethan Hopewell of Powell Gilbert and Laura Kehoe of Keltie set out the details of the UPC and Unitary Patent respectively, while Kevin Brown of NVIDIA summarised the priorities for industry, including: cost, predictability and flexibility. However, as Thomas Prock of Marks & Clerk said, national courts are likely to remain important, given that many patentees in the high-tech sector don’t validate in all countries, and national procedures are well established and predictable, even on issues such as the patentability of software. In part 5 we showed new admissions that trolls would be aided by the UPC and here we have the subject brought up again, this time by British/international law firms. Notice that among the topics mentioned above is “patentability of software.” MIP continues to deny that UPC will have an impact on patent scope, conveniently ignoring everything that experts have been saying for years. Speakers include “Heli Pihlajamaa, director of directorate patents, European Patent Office” and “Principal patent analyst, patent strategy, Microsoft” (lobbyist for software patents). The Unitary Patent is going nowhere, but as panels are being stacked here we can envision something a whole lot like of “echo chamber” at play. “Patent/IP counsel, heads of legal” enjoy “FREE attendance,” which means the event will get stuffed with patent maximalists. This is how Managing IP ensures it’s just an echo chamber whenever they speak about software patents, UPC, etc. Typical. Dr. Luke McDonagh said to MIP it “would be extremely pointless to ratify UPC, put resources into London court then leave anyway on Brexit in 2019 or thereafter.” (he responded to MIP’s statement that the government’s “statement doesn’t make any commitment post-Brexit”). Or maybe it just reveals that May and Lucy don’t know what the heck they are doing. They contradict themselves, as we showed in the previous part. The person whom McDonagh responded to in the latter case had said that “IP Minister Baroness Neville-Rolfe expected to make statement on UK’s position regarding unitary patent and UPC at 5pm (UK time)” (there were already rumours about what would happen). Watch how MIP distorted the record on this. Team UPC tries to raise the exit barrier by greasing up Lucy and turning the EU into a patent warzone. MIP helped them with tweets like this one : “Initial reaction to today’s #UPC news on Twitter seems overwhelmingly positive, especially from other EU countries” (not really, see the previous part of this series). –Dr. Luke McDonaghWhen you live in an echo chamber and all you read are a bunch of patent law firms that you are subscribed to in Twitter, then inane statements like the above come out. “Been looking at all tweets with #upc,” MIP wrote. “Interested in all (informed) views!” But don’t they know that Twitter prioritises tweets from those whom they follow? Or that not everyone uses the same hashtag? Maybe they also subscribe to IAM, reading the magazine’s latest Kool-Aid from Sofia Willquist, Alan Johnson, Julia Mannesson, Gottfried Schüll, Christoph Walke and Dominic Adair. To quote the opening part alone (there is a paywall): “The decision by UK voters to leave the European Union has thrown plans for the Unified Patent Court into chaos. Specialists from three top European law firms discuss what is likely to happen now, as well as other key issues” (they evidently wrote this before Lucy wrote a statement, which technically changed nothing at all). Maybe Battistelli can throw some “Cooperation Money” at her, as he so often does. It’s his convenient way (method of choice) to pass a gift in exchange for a favour. Remember that Battistelli's legal firm that threatened me (in an effort to silence me) is itself part of Team UPC. This whole system rots when one realises just how well-connected all these things are. 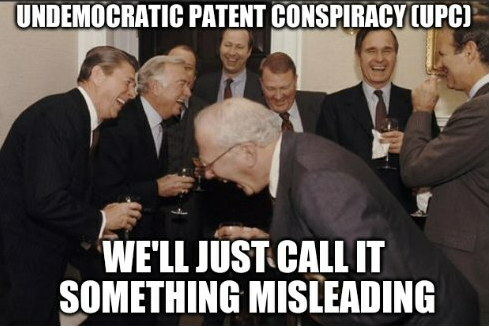 Patent lawyers set up bogus debates and lie to everyone using their media while even advertising bogus job openings (never mind setting up of courts prematurely) to cement this illusion of inevitability. Well, never underestimate the ability of Team UPC, the EPO and Battistelli to shamelessly break the law and get away with it. Nothing is as advertised and there is a lot of bullying, especially towards those who dare challenge the lies. As one person explained it to MIP last week, “as rights holder would not engage with UPC without certainty of CJEU decision as to whether non-EU state can be UPC CS” (also see the aforementioned comment about CJEU). Businesses in the UK, if or when the time is right, should be able pool resources to take on Team UPC, maybe even taking these firms and their buddies to court over it. No doubt UPC opponents, i.e. just about everyone except the patent microcosm, will organise to antagonise any British attempts to override democracy, but for the time being it doesn’t look as though ratifying the UPC in the UK is even possible. It’s all just talk. The UPC has all along been ‘marketed’ using a big bundle of lies. Politicians who are foolish or corrupt (maybe both) repeated these lies, but the repetition itself does not make the lies true. The so-called ‘Unitary Patent’ is nothing but a conspiracy and some texts weaved together by those who are already rich in order to guard or expand their wealth. TPP was constructed in the same way and it didn’t take it long to collapse, as soon as the public found out about it and started fighting. “Brexit is simply not compatible with the UPC.”Well, the UPC is still far from a reality and we need to keep it that way. The UPC would be a slap on the face of 99.9% of Europe’s population and if we set up a petition against it, we expect outpouring of support. For the time being, however, it doesn’t seem like we’re in danger of UPC verging a reality. Tweed deleted his three tweets before I had a change to respond to them, but either way, I don’t know what SMEs he spoke to and what they have been told about the UPC. It seems like they were seriously misinformed as a lot of the above is untrue or inaccurate. “Techrights is probably one of the very few sites pursuing the truth about the UPC and we intend to continue to do so.”To sum it all up, CIPA and others have been greasing up Lucy Neville-Rolfe with assertive letters, lies, lobbying events etc. This may have paid off for Team UPC in the short term, but it’s not actually changing the technicalities. Brexit is simply not compatible with the UPC. How many Brits (or Europeans in general) know that UPC is intended to help lawyers and large clients systematically rob them all? A lot of these so-called ‘news’ sites that celebrated the UPC last week were actually not news sites but Web sites of UPC conspirators that also set up lobbying events. Some news sites were also bribed by the EPO, so no wonder they sent out (or ‘beamed’) false information for other sites to faithfully parrot. Another part of Team UPC is joining this echo chamber. They are blogging about themselves under the heading “UK signals green light to Unified Patent Court Agreement”. But can they actually do this? No. Not really. All those sham debates like the one we wrote about this afternoon may make Team UPC feel confident, but they’re in for a surprise. Did we ever see any software developers at UPC events? Nope. Just lots and lots of lawyers and sometimes large businesses and executives who hire these lawyers. The EPO also dispatches Margot Fröhlinger to lie to the audience these days. Talk about preaching to the choir… what a pointless exercise in lobbying (to guests like politicians). Need we remind readers that MIP, Egbuonu’s employer, is virtually in bed with the EPO? We wrote about half a dozen articles about MIP’s UPC advocacy and relationship with the EPO. Do they really think that the public isn’t seeing this? Do they honestly believe they’re seen as objective observers? It’s not as simple as that at all. In fact, if it ever gets this far, the population will quickly learn about what’s going on and then point out that these agreements are not constitutional and that the public is not being informed. It’s going to end up like ACTA and TPP. Sorry Darren, but “proceeding with preparations to ratify the Unified Patent Court Agreement (UPCA)” does not mean the UK will ratify the UPCA. The ratification is anything but certain. The move is simply to gain time and to try to have a better bargaining position when the actual Brexit negotiations are starting. The day UK will sign the protocol on immunities, I will believe that ratification is on its way. Before this, it is just gobbledygook. In clear it means UPC is further delayed. As long as UK threatens to ratify the UPC, but actually does not do so, the UPCA will be held in limbo. It is meaningless to continue with the preparations if there is no clear will to ratify. The present statement is anything but a guarantee for ratification. And even if UK would ratify, could any sensible representative advise his clients to go for a unitary patent when it is not clear what the future of the UPC will be once UK has left. A proper decision on the ratification will not become before the start of negotiations under Art 50 Lisbon. It should be by March 2017, or even later when taking into account the legal battle about the involvement up front of the parliament. The situation created by this statement is not very pleasant for the remaining contracting states, but that is not to be a surprise. It is like the participation in the EU: we want to participate, not for the sake of being a member, but simply to insure that nothing can happen which goes against our interests. The only way for the other contracting state to get out the deadlock is to give a time limit to the UK for deciding whether they want to ratify or not. As some other commentators have remarked already, the government statement should not change much for the moment. Bearing in mind the history of the UPCA and its contents, it is a rather bold claim to say that the UPC was “not an EU institution”. On the other hand, this is pretty much along the lines shown by the UPC proponents from the patent profession. Also, we have repeatedly seen such formalistic sharade being applied in the very same context, e. g. when it comes to the solution on Art. 6-8 or the position of the EPO in relation to unitary patent protection. It is rather characteristic of the project as such, that a government obviously sees itsef forced to rely on positions as weak as these. Anyhow, the announcement should bring the German ratification procedure back to life shortly. Should it be completed smoothly (which is not certain), I would expect that at least the German ratification instrument will not be deposited until there is a binding solution of the UK ratification issue instead of cloudy declarations of intent. “The one about building a castle for my dead goldfish is my favourite,” Tufty the Kat wrote about it in Twitter. We know some people who have already contacted UKIP about this and UKIP is aware of the issues. That won’t go down well, will it? “Postpone the difficult questions for later,” one person wrote to explain what May and Lucy do for Battistelli here. Why should the UK ratify an agreement it may well be forced out of during Brexit negotiations? Is the UK really so naive as to think that the EU is not going to look after itself first? Without a guarantee the UK should sit still and let the negotiations play out….. The answer to this rhetorical question is “no”. It makes no sense whatsoever. “I fear that this is the worst of both worlds for the UK profession,” wrote another person. “I had watched my Trade Mark colleagues who are today in an EU system and who are faced with the prospect of exiting it with a certain smugness until today. Now we have contrived to enter a system that we may need to leave. “Blinding negotiation tactics too Neville-Rolf! “Perhaps the conclusion is that this improves the UK’s negotiating position,” this person added, “especially if the court gets well “embedded” in London? Theresa May. October 2016. Conservative Party Conference. So again, May is contradicting herself. She’s trying too hard to appease CIPA and some law firms. And the roller coaster continues…wow, just wow, haven’t had this much excitement in years, please pass the paper bag, I’m feeling a bit queasy. So according to our illustrious representative for IP, the UK is continuing with its efforts to sign up to a deal that will force sovereignty of the EU court system on its national courts even if it is no longer a member of the EU – can’t imagine how that will go down with the erudite population that so loudly voted to “take back control”…and, in passing, one in the eye for the greedy Italian governement though, eh, thinking its day had come to shine and bask in European institutional glory ? I wonder what Michel Barnier thinks of all this, he was after all, the mouthpiece of the political rationale to cajole the various EU states into agreeing to the UPC in the first place – the mind boggles ! It seems Britain really does want everything: to leave the EU but to remain part of an important new EU patent system (which most of the Europeans outside Germany, France and UK didn’t want anyway). How can it think to ratify the UPCA when is has voted not to be part of the larger EU? Isn’t this a case of the bureaucratic machinery wanting to plough on when the field has already disappeared in the storm? Madness indeed and probably a waste of tax payers money.. Sorry to say (as a UK ex-pat lawyer) but the UK government behaving like a big kid that wants to eat the cherries and cream on the top of the cake but has already refused to eat the sponge layers…. I too spotted the absence of a firm commitment to ratify. If this is simply playing for time, however, it would have been better if the IPO had avoided statements such as “It [the UK] will be working with the Preparatory Committee to bring the Unified Patent Court (UPC) into operation as soon as possible”. If that is not intended to mean what it so clearly implies, then the UK will end up burning a lot of bridges… which would not be the best of starts to exit negotiations with the EU Member States! Ah, sure. Except that Art. 20 of that very agreement you intend to ratify explicitly says that the UPC shall apply European Union law in its entirety and shall respect its primacy, and Art. 21 adds that decisions of the Court of Justice of the European Union shall be binding on the UPC. I’m with the commenter “do not pull my leg”. The announcement was devised by little Baldricks, completely clueless how mainland European minds work, who think they know how to “game” the forthcoming BREXIT negotiations, who have their cunning little plans how to come out of it with the best “deal” for England. To those infected by wishful thinking I would suggest that the announcement reveals no HMG commitment whatsoever, just more playing for time, by an Organisation that hasn’t a clue what to do next. our comments suggest that you believe that mainland European minds and English minds work differently? At best that sounds like some mild racism, or possibly you adhere religiously to national stereotyping? Without even appreciating which nations are involved: “Brexit means UK exit”. At least for the time being, the little Baldricks are meant to be devising cunning plans for the best “deal” for the UK. I entirely agree that the little Baldricks don’t actually have any cunning plans and that HMG hasn’t a clue what to do next. Otherwise we wouldn’t need any announcement before actual UK ratification. Perhaps some political justification was required for the continuance of the ongoing UPC project at Aldgate Tower in London? So the consensus seems pretty clear in IP Kat comments. It’s a shame that the media, led by EPO-bribed publications, missed the real story and instead parroted publications like the Financial Times, obviously unaware of its financial ties to the EPO. Actually, there is plenty of time. Just a statement on some Web site is hardly enough to propel the UPC into a reality. It was the same in the days of battles over software patents. For who? IAM and its readers? On a separate occasion MIP wrote “UK to ratify UPC. Huge news for Europe, for global patent litigation & maybe an indication that whatever the rhetoric Brexit will be softish” (either way, Brexit means that UPC would be tricky if not impossible to start/maintain). There were also some responses from other countries (“#EUCouncil #Compet Good news – UK about to ratify the unitary #patent agreement”), but these fail to take into account practical limitations. Who is this good news to? Patent law firms? Patent trolls? Patent bullies? All the above? At whose expense? And are they just building false hopes? THE PREDOMINANTLY FRENCH EPO management is a gold mine of scandals, yet German officials seem less interested in these scandals than French officials, seeing what a huge PR disaster Team Battistelli has become for France. Germany’s Heiko Maas was mentioned here this morning and also last night in a caricature. He is now mentioned in this new article titled “Europäisches Patentgericht: Nun holpert die Vorbereitung in Berlin” (translation from German is needed) and we hope he intends to actually start paying attention to what happens at the EPO right now. How was the situation to begin with? The csc had legally chosen representatives in the appeal committee. Is that correct? Then BB suspended/dismissed those members. Is that correct? But they still remain the legally chosen representatives, wouldn’t they? So when management refuses them to take part in the appeal committee, who is blocking the procedure? Please, can someone explain to me if this is the actual situation? Thank you! What kind of judge wishes to explore an internship? The Boards of Appeal (BoA) are SEVERELY (or critically) understaffed, so what the EPO needs is hiring of full-time staff, not interns. THE evolution of patent law helps determine the rate of innovation and competition. It’s not as simple as “more patents” mean “more innovation”. In fact, some patents help protectionism and actively impede innovation, so these cases are important, especially when they are decided by Justices in the US. The four winners are: the US Food and Drug Administration for an improved meningitis vaccine; the Global Good Fund at Intellectual Ventures for a cooler which can preserve vaccines for over a month without outside power source; Case Western Reserve University for creating a low-cost, accurate malaria detection device using magnets and lasers that allows better diagnosis and treatment; and GestVision Inc. for developing a quick, simple diagnosis test for preeclampsia, a potentially life threatening pregnancy complication, for use in developing regions. The Supreme Court has agreed to hear a closely watched patent case that will determine whether someone can import into the United States and resell a U.S.-patented article purchased abroad. 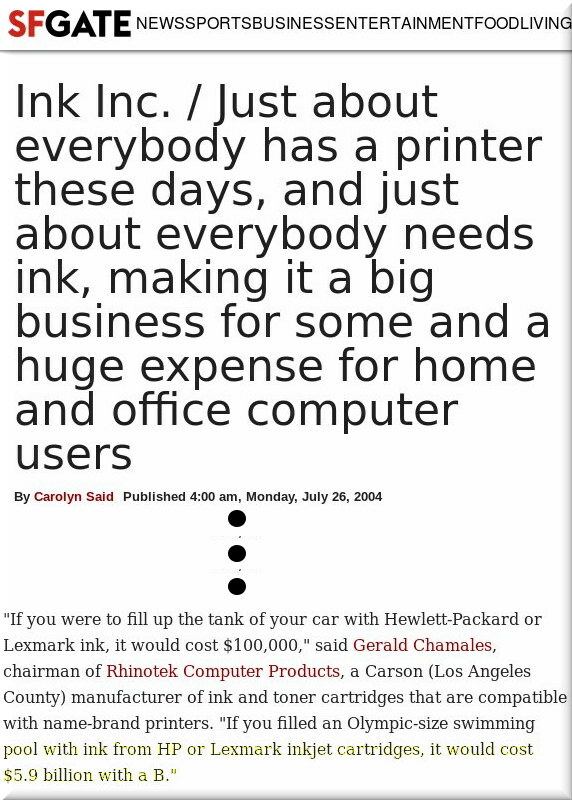 Generally, the buyer of a patented product has the right to resell that product to a third party, but the case here stems from printer cartridges that Lexmark International sold on the condition that they not be resold. Lexmark brought a federal complaint in Ohio several years ago, saying Impression Products had acquired its spent cartridges abroad, refilled them and resold them. For those cartridges that Impression imported into the United States, the products were priced more cheaply than Lexmark charged. There will certainly be plenty of coverage about this, including quite a lot of rants from Apple advocacy sites. Apple lost a design/UI patent case. It has actually lost quite a few cases against Samsung by now. Many other patents in this domain will be generally lost too, by means of precedence (how many patents out there are no longer valid?). In a unanimous opinion authored by Justice Sotomayor, the Supreme Court has reversed the Federal Circuit in this important design patent damages case. Although the case offers hope for Samsung and others adjudged of infringing design patents, it offers no clarity as to the rule of law. On November 29, 2016, in Apple Inc. v. Ameranth, Inc. 15-1703, the Federal Circuit affirmed the Patent Trial and Appeal Board (PTAB) findings of unpatentable independent claims in a Covered Business Method (CBM) review and reversed findings of patentable dependent claims under 35 U.S.C. § 101. On appeal, the Federal Circuit agreed with Apple that there was sufficient evidence to support the finding that dependent claims 3, 6-9, 11 and 13-16 of Ameranth’s U.S. Patent No. 6,982,733 (‘733 patent) were unpatentable as describing insignificant post-solution activities. Despite Ameranth arguing for a substantial evidence standard of review, the Federal Circuit applied a de novo review standard in its reversal of the PTAB’s decision. SEVERAL years ago we wrote a lot of articles about the thug and troll Ray Niro, whose ugly legacy we summarised in this Wiki page. We have hardly heard his name for years, but today IP Kat pays respect to this father of patent trolling as if there is a duty to say something nice because he is dead. Our own list of articles about him can say a lot about how horrible a person he was, but obituaries in news sites are unbelievable pieces of hogwash. Won’t they just stop eulogising this thug? Talking trolls – While the debate around ‘patent trolls’ using poor quality patents to extract low value litigation settlements has dominated IP policy discussions in the US, there has been relatively little focus on it in China. To what extent that might change was brought up in the second plenary session today by Lenovo’s head of IP Ira Blumberg. Asked by session moderator Brian Hinman, the chief IP officer of Philips, to identify the things that keep him up at night, Blumberg said that his long-term concern was that if patent damages awards continued to increase, the number of patents available to buy continued to grow as a result of widespread filing and with preliminary and permanent injunctions available, then ‘patent trolls’ could become a major problem in the Chinese market. “If handled in the wrong way China could be beset by trolls,” he commented. As well as the prospect of higher damages and the growing threat of patent owners obtaining injunctive relief, the real threat to the Chinese market stems from the fact that it is such a large manufacturing hub. That gives patent owners great scope to disrupt a company’s production facility or its supply chain and might mean foreign and local businesses start to look to other jurisdictions to make their products. “If courts give out big awards then the natural reaction will be for companies to relocate their manufacturing,” Blumberg warned. “China needs to be very careful about how its patent system develops.” Once of Intellectual Ventures, Blumberg has become a vocal critic of trolling over recent years. As we have seen in the US, though, the problem with focusing on finding solutions to combat the perceived threat this business model poses often ends up causing a lot of unintended harm. The Chinese authorities would do well to consider that when they hear the kinds of dire warnings issued by Blumberg this morning. He does have a point, but careful, nuanced policy-making is perhaps the best way to solve any problems that arise. Looking to Europe, rather than the US, and finding out why there is no real troll problem there may also be a good idea. What is clear, though, is that as the Chinese patent litigation market does become more high-profile and more high-stakes, the troll debate is going to have to take place in the country. REMEMBER how earlier this year Bavarian TV reported that Battistelli’s goons contributed a lot to the suicide of at least one employee? Remember how the EPO’s management responded to that? Remember the fact that Battistelli denies access for investigators to get to the bottom of it, perhaps fearing liability for deaths (or inducing deaths by breaking national laws in Germany)? A prominent retired judge from Germany compared this to Guantanamo Bay on Bavarian TV. Eponia is a lawless place. Battistelli is like the Sultan of Brunei and perhaps even like Erdoğan in 2016 (after the coup attempt). Earlier today we wrote about Battistelli's attempts to retroactively legalise his own abuses so that he won’t have to obey the UN’s (or ILO’s) ruling, much like the British government continues to disobey the UN’s determination on Julian Assange’s fate. “Contact the delegates and let them know what kind of monster they’ve put in charge of the Office. They’re going to convene again just over a week from now.”We are aware of such stories and cases, but we did not know that these sometimes resulted in suicides. Perhaps it’s time to bring this to the attention of politicians across Europe. In a sense, the EPO can literally kill workers, if not working them to death then driving them to suicide after Team Battistelli ‘pulled an Erdoğan’. 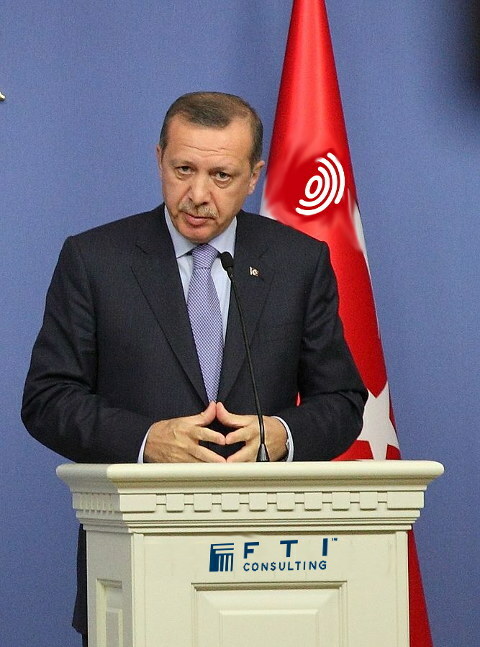 Remember that Erdoğan not only wants the death penalty back but also wants his opposition to suffer so much (mental torture) that they would want to take their own lives (but will be denied that request/ability). This was all over the news throughout the year. Confer recent paper from Professor Joshua Pearce, "A Case for Weakening Patent Rights"
THE scope of patents in the US has been tightened by the US Supreme Court under Obama, but there is a growing threat — and belief among patent maximalists — that things will change under Trump (perhaps premature to speculate about this). PTAB is at stake, Alice is at stake, and perhaps more aspects related to AIA and the Supreme Court (where vacancies exist for Justices, not just because of Scalia’s death). According to this new article, the “Supreme Court Patent Cases Haven’t Hindered Diagnostics Innovation, Preliminary Data Suggest” (article behind paywall). They might be referring to cases like Mayo (Supreme Court) and they need to stop conflating patents with innovation. In some cases, not only do patents contribute nothing to innovation but they actually harm innovation. Well, software developers want only copyright to protect their code. Many polls/surveys keep showing this, yet the patent microcosm ignores the findings and pretends that software patents are desirable (to the litigation industry they are definitely desirable, but at whose expense?). “Well, software developers want only copyright to protect their code.”The term “inventorship” totally misses the point that patents are granted not necessarily for inventorship. These sorts of fairy tales that are perpetuated ad infinitum in legal blogs do a lot of harm and software patents propagandists (who do not even know how software works!) call reformists the “patent infringer lobby” because they are trying to undermine Alice and the likes of it. See this disgusting latest article from Watchtroll for example. What is this? Is Watchtroll some kind of a troll? A spokesperson for patent trolls? As expected, for the fiscal year ending on October 31, 2016, the Federal Circuit docketed more appeals arising from the U.S. Patent and Trademark Office than from the district courts. This result will almost certainly hold true for the calendar year as well: from January through October of this year, the Federal Circuit received 471 appeals arising from the district courts and 560 appeals arising from the PTO. That’s because of PTAB, which is a growing force after AIA (the catalyst that introduced it). Some patent maximalists now use this as an excuse to weaken or lobby to altogether eliminate PTAB, bemoaning the ‘flood’ of appealed PTAB cases (examinations/IPRs) as though it justifies anything but more (new) hirings at CAFC. As is the case with programming (code), sometimes it requires more work to actually remove code than to add/write new code. In this case, what the USPTO needs is less patents, not more patents. It’s worth investing money in invalidation of bad patents. Sometimes less is more (or better quality of patents, higher certainty and so on). “The term “inventorship” totally misses the point that patents are granted not necessarily for inventorship.”The US is currently in the process of cleaning up a mess created (or culminating) in the David Kappos era and thankfully we now see software patents being invalided by the thousands and patent lawsuits (including the majority of which that are filed by patent trolls) in a freefall.